My shopping list was probably different than most shoppers' today. AND...my early Christmas present! I got the second to the last one at Lowes and felt like I won the jackpot. A portable air compressor/nailer! It was $60, and then I had a $10 coupon from the mail. We haven't decided on a house yet and we may rent for awhile, but I really can't wait to shoot the first nail. The air compressor...Now I'm depressed! I forgot to go to Lowes! Great finds Melissa! 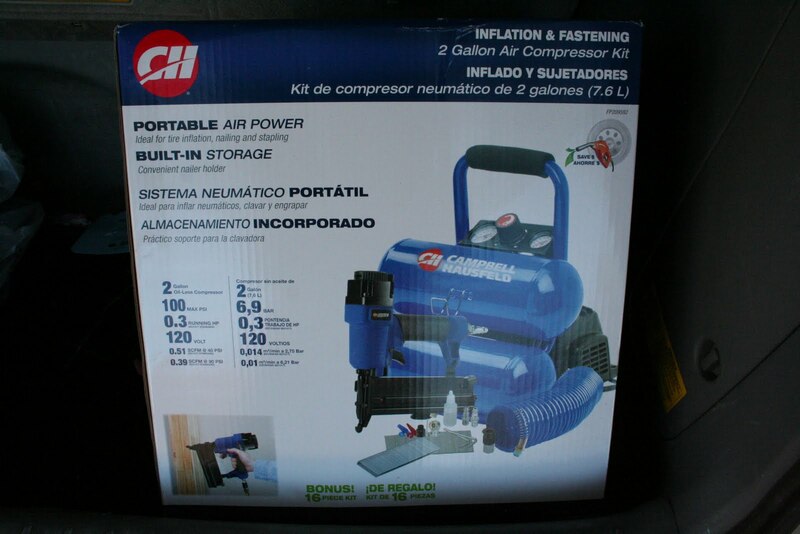 Awww, I have been wanting that air compressor!!! Geez, how did I miss that deal????? I love my nail gun, but I have to use it with our large air compressor, luckily I have a really long hose that will let me take the nail gun in the house! We moved at Christmas one year. I bought a small tree and decorations and used that for our family tree. When we moved, we gave the decorated tree away - no packing and the other person enjoyed a special treat! I didn't leave the house today because I stayed in watching The Godfather for the first time, but I wish I would've thought of those places, because I would've gone for that! So sad (but happy for you) about the compressor--I've been wanting one! Maybe I'll see if I can still salvage something tomorrow at Lowe's (I know, fat chance . . . .). sounds like my kinda shopping list. I bet you'll be nailing stuff all over the place soon. Oh, that's so hard to move right before the holidays. I totally understand. I hope you find a great home, soon, so you can start shooting those nails and sharing it all with us. 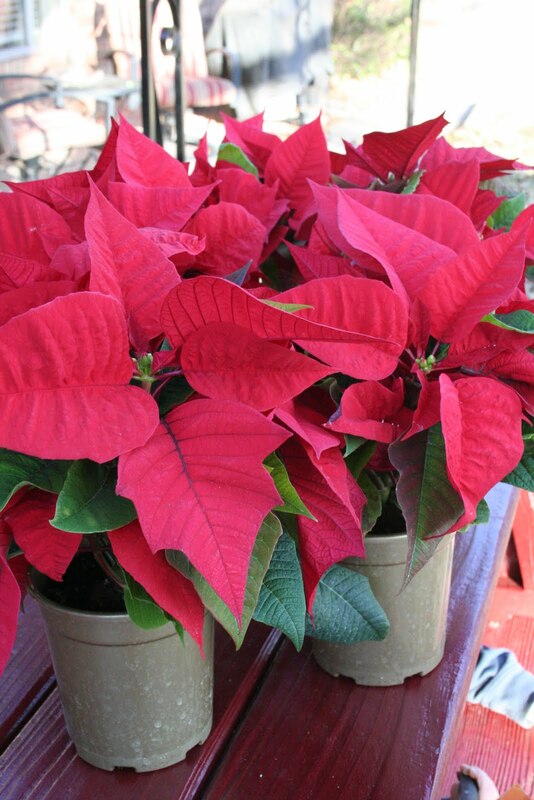 Michael's and Home depot (for their 99 cent pointsettias) were the two stores I didn't make it to yesterday. Sigh, this week to Michael's at least- gotta. get. some. ribbon. 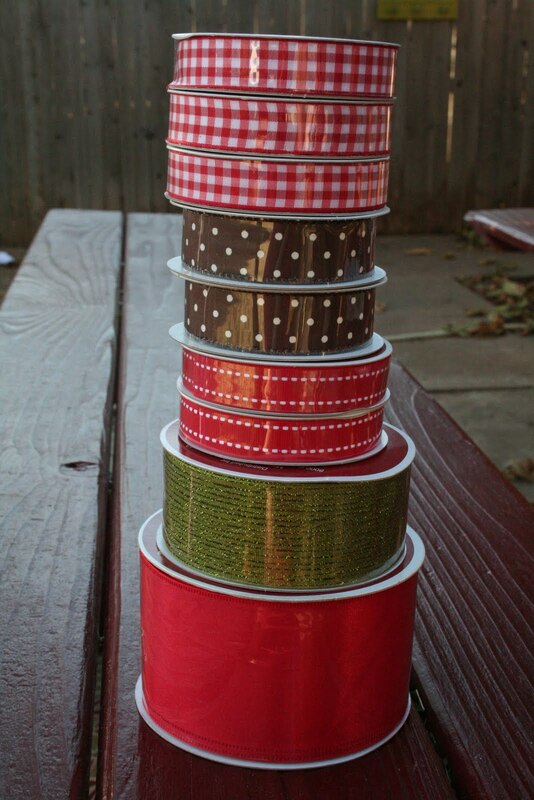 Oh...I didn't have Michaels on my list, but that is an awesome deal for ribbon! Great finds...love it! I know it is a bad time to move and I am sorry you can not decorate. I hope you will get settled quickly wherever you end up and be able to enjoy Christmas! Have a wonderful day! We're in the same boat. We're moving on the 22nd! And all our decorations are in storage. So we'll just make due with kids construction-paper decorations until then! It's all about what you make of it! I wish I would have bought some ribbon at Michael's! Oooh, I love the ribbons, especially the polka dots! Have fun pulling out a few of your favorite decorations, friend! Will you be in a new home before Christmas? Right there with ya, babe! I'm only pulling out the stockings, and promised the kids we'd get a small tree (but we're decorating it a little different than we traditionally do because I don't want to pull out the boxes of ornaments) Moving at Christmas time isn't my favorite thing. Ah well. Hello sweet Melissa - Your black Friday sounded like mine! I went to Walmart for toilet paper and Red Bull and came out with the cutest 25" white Christmas tree, and a few ornaments that I wasn't planning on. I couldn't believe the good deals and the lines weren't long either. Glad you got your gun! Green green green with envy over your compresser/nailer.... for that price ? I want one SOOOOOO BAAAAAAD. Do ya hear me Santa ? You scored some great deals all around !